The architecture of Turkish traditional houses is influenced by a variety of climactic and natural resources, by the traditions of earlier houses remaining in Anatolia from the Byzantine era, and by traditional Turkic culture, which was brought from Central Asia by the Turks. Local materials, both natural and inorganic, give Turkish houses their character and identity; in North Anatolia, the wooden houses from rich forests; while in Central Anatolia, the stone and sun-dried brick houses; in West Anatolia, stone; and in South Anatolia, stone and wooden houses. In conjunction with these principals, the interiors of Turkish houses were planned for different purposes, like the winter and the summer rooms. In addition, Islamic and Turkish customs played a great part in shaping the house. This factor brought on a common plan, which made Turkish houses more homogenious, though there were still climatic and regional differences. The Turkish house in an urban setting was a reflection of the requirements of family life. The women were excluded from public life and their existence was confined within the walls of a single house. The various domestic chores performed jointly by the women of the extented family required the organization of the house around open interior spaces, enclosed and hidden from the outside world. The front of the houses facing the street were blank or had very few windows. An upstair room with view of the street had windows concealed by wooden lattice-work screens so that women could observe the activities on the street without being seen. The rooms had built-in divans, fireplaces and wall niches with very little movable funiture required. Their arrangement, size, and decorations were always austere. Reference: E. Akurgal. 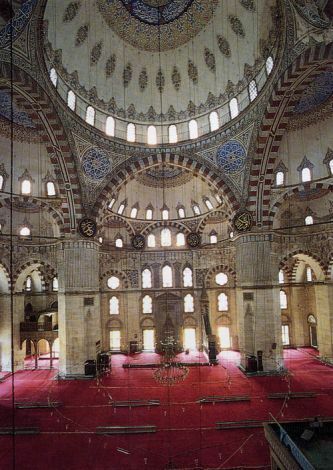 The Art and Architecture of Turks. NY: Rizzoli International Publications, 1980; Önder Küçükerman, Anadolu Mirasında Türk Evleri. Istanbul, 1995.